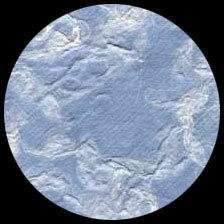 DESCRIPTION: This paper 's breathtaking cloud texture is created from mulberry pulp. The base paper, which is also mulberry, has a slightly translucent appearance. Deckle edges are on all sides. Imagine using these as a background in a paper landscape collage. Or as a dreamy ceiling in a bedroom. Beautiful for layered invitations, altered books, lampshades, and more.